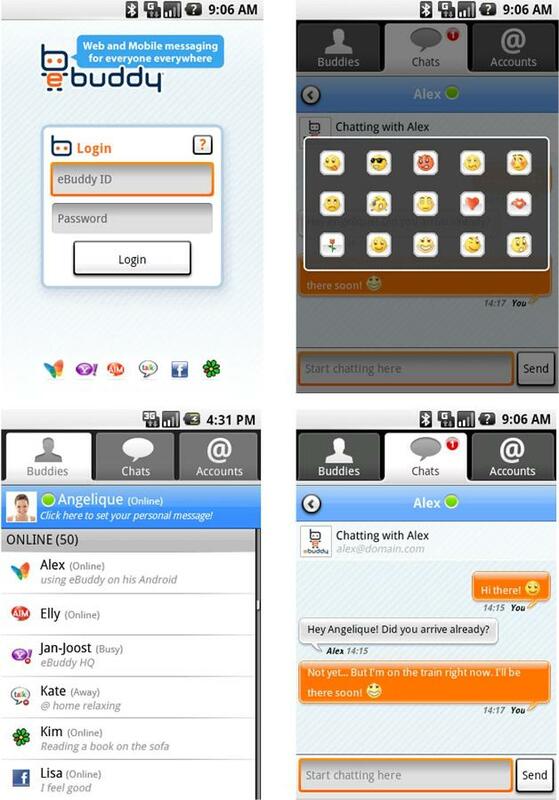 The Netherlands-based eBuddy, which markets a comprehensive application that lets users handle multiple instant messaging accounts from the web or their mobile phones, is today releasing an application for the Android platform a couple months after Meebo made its similar product available on there (November 2008). The eBuddy application for Google’s open mobile OS is now available for free on the Android Market, and users can thus benefit from a single ID to chat with their friends on third-party communication platforms such as Facebook, Gtalk, Yahoo Messenger, Windows Live Messenger, ICQ and more. No Skype chat yet, which is a bit of a bummer, but apparently the startup is looking to add that functionality in their mobile clients in addition to all the other ones currently supported. I wonder which startup will be the first to bring Skype chat to Android, since neither Meebo nor eBuddy currently support it and both Nimbuzz and fring, competitors that do support Skype IM through their mobile clients, have yet to make their way to the open platform. What I like about the eBuddy application is that it has the ability to run in the background, so when you receive a phone call the IM service will keep running and even reconnect you automatically when the internet connection is lost. If you maintain multiple friend lists on instant messaging tools, eBuddy neatly organizes all your contacts in one list so you don’t even need to think about which third-party service you should be connecting to, and lets you seamlessly jump from one chat conversation to the next. On a sidenote: I can’t grasp why Android Market doesn’t offer a search function on its regular website – only on mobile – but if you ever want to look for applications that are available on Android you might want to check out Cyrket.com. The eBuddy app is listed here. I got eBuddy, which is backed by a healthy €11.5 million (which currently converts to approximately $15.6 million), to share some numbers to get a feel of the traction it’s getting in the market, and came away fairly impressed. These are the numbers they pitched me: 20 million mobile downloads of the J2ME mobile client since its launch in June 2007, 5+ million unique monthly mobile users on eBuddy Mobile, and with almost 14 million downloads of eBuddy Mobile Messenger on GetJar the top ranked mobile program on the platform. 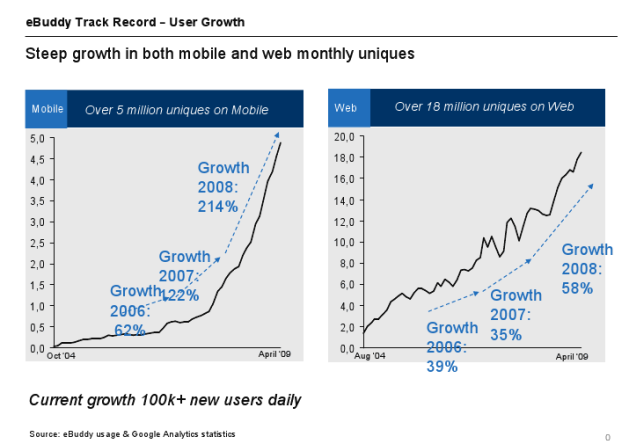 Stellar upwards-pointing trends indeed, but this type of hockey stick growth is of course no guarantee that all these new users will be efficiently monetized over the long run. Only time will tell if eBuddy finds a way to turn its successful product into a profitable business.